Things had started off so well for Lauren Goodger last night. But it ended with a tumble in her six-inch heels and an awkward encounter with her enemy Luck Mecklenburgh. The Only Way Is Essex star celebrated her sister Nicola's birthday at the Brickyard Bar and Grill in Romford. 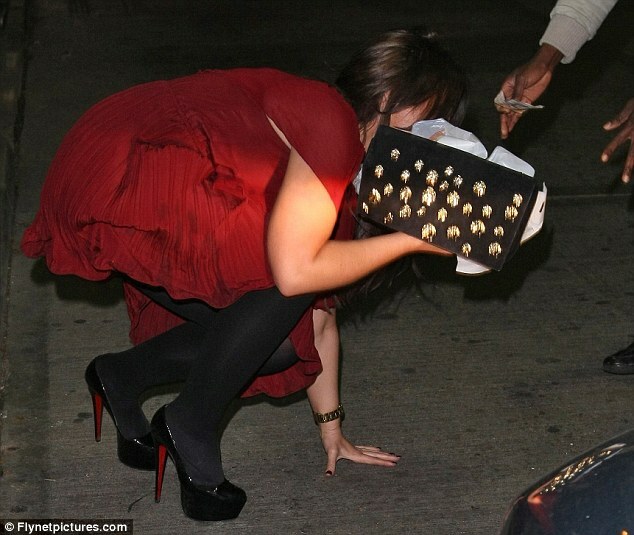 After partying with her sibling, she was seen falling over in her towering Louboutins as she visited a petrol station. She managed to break the fall with her hand before a kind strange rushed over to help her up. Lauren dressed up her curvy figure well in a flowing red dress over black stockings. Her newly-dyed dark hair was curled slightly and loose over her shoulders, and she had a face full of thick makeup including pink lips and bronzed cheeks. Lauren ran into Lucy at the restaurant, and was seen leaving 15 minutes later. The pair have been enemies since Lucy dated Lauren's ex, Mark Wright, and the latter was seen recently flirting with Lucy's current boyfriend, Mario Flacone. Lucy looked gorgeous in a long-sleeved black lacy number and peep-toe heels. She held a small gold clutch to complete the number.